One of the things I love most about the chilly weather is that it inspires me to make homemade soup. I love tossing ingredients into a pot and letting them simmer away, infusing the entire kitchen with warm, delicious smells. This pureed vegetable soup recipe is loaded with healthy vegetables and made creamy with the addition of coconut milk. Adding harissa paste at the end gives it a bold, Middle Eastern flavor that is absolutely delicious. Got Extra Veggies? Turn Them Into Pureed Soup! Homemade soup is a great way to use up tons of vegetables. What vegetables can be pureed? Basically, any of them! Obviously flavor and texture will vary a bit, depending on which ones you include. For this pureed vegetable soup recipe, I used broccoli, cauliflower, carrots, celery, onion, and garlic. Saute, simmer in broth until very tender, and puree using an immersion blender. Yes, you could transfer the hot soup mixture to a regular blender to puree. However, that requires a lot of handling of incredibly HOT soup. I bought an immersion blender years ago and seriously love it. If you plan on making pureed soups, you really need to invest in one! This pureed vegetable soup recipe is vegan, which makes it perfect for a Meatless Monday dinner recipe. 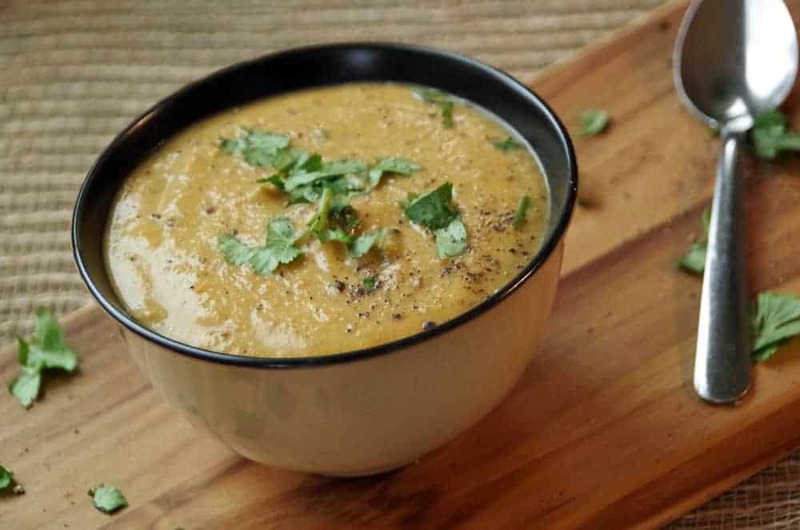 You don’t need actual dairy products to make a creamy vegan soup. Coconut milk is a great alternative to dairy when making homemade soups. I chose to use the lite coconut milk, rather than the full fat version. It was still PLENTY creamy. When making vegan soups, you can saute your vegetables with coconut oil or olive oil. Use vegetable broth rather than chicken broth. There are a ton of easy alternatives when making soup that don’t require any meat at all. Of course, I love a good chicken noodle soup, however, not every soup recipe needs meat! I have just discovered a bold new spice that I absolutely love. Harissa paste can be purchased premade to make this Middle Eastern inspired soup, although you can also make it from scratch. What is harissa paste? 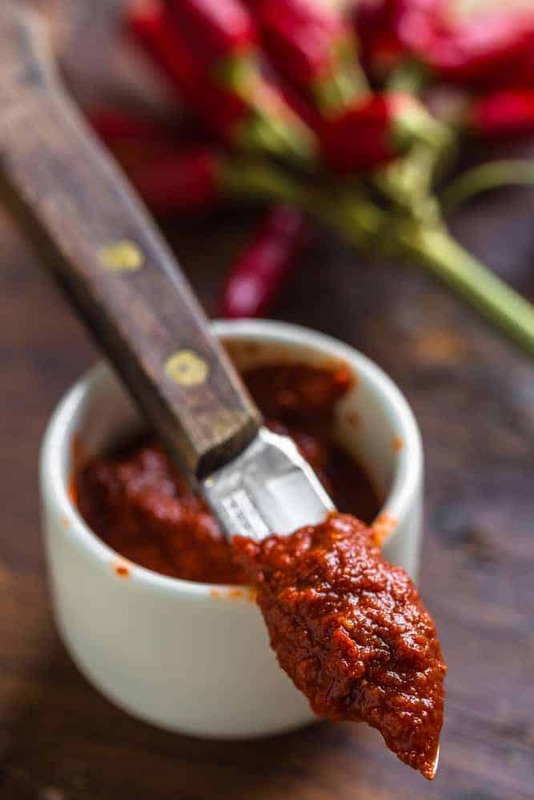 Harissa is a spicy and aromatic chile paste. It’s widely used as a staple in North African and Middle Eastern cooking. Basically, dried red chili peppers are ground to a paste with garlic, spices, lemon juice and olive oil. 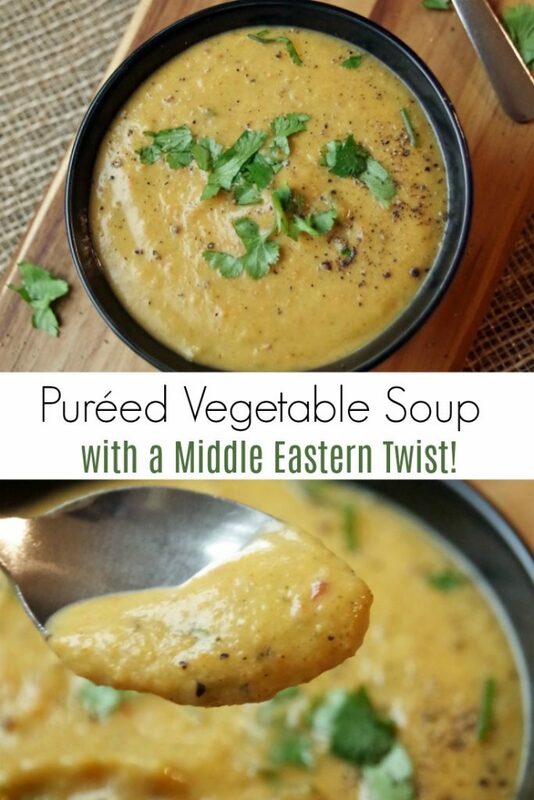 I added a few tablespoons of harissa paste at the very end of cooking to give this pureed vegetable soup recipe a bold Middle Eastern flavor. If you can’t find it at your local grocery store, you can check at larger ethnic grocery stores or buy it on Amazon. This Middle Eastern inspired pureed vegetable soup recipe takes less than an hour to make. It is an easy one pot soup that is incredibly healthy. We all loved the creamy texture and bold flavors. 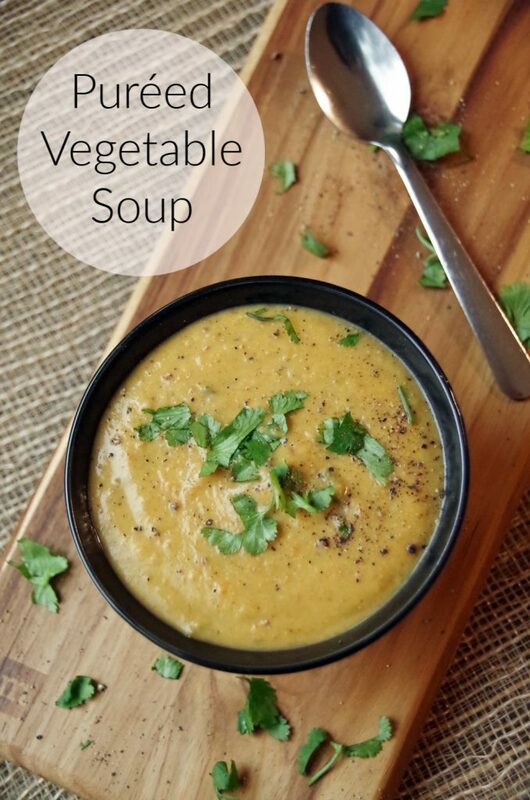 Definitely putting this homemade vegan soup recipe on our Meatless Monday rotation! This pureed vegetable soup recipe is loaded with healthy vegetables. Coconut milk and harissa paste give it a creamy, Middle Eastern twist. Heat coconut oil in large soup pot over medium high heat. Add all chopped vegetables, cooking 5 minutes or so until slightly soft. Add stock, salt, and pepper. Simmer (covered) until vegetables are very soft. This took me about 20 minutes or so. Turn off the heat and with an immersion blender puree until smooth. Add the coconut milk as needed to make it easier to puree. Add remaining coconut milk,lemon juice and harissa paste. Ladle into a bowl and garnish with cilantro before serving.